Kansas State wasn’t a polished team in its season opener Saturday, but the Wildcats did show glimpses of how good they could be once they are. Big plays from cornerback D.J. Reed and receiver Byron Pringle led the way in No. 20 K-State’s 55-19 victory over Central Arkansas at Bill Snyder Family Stadium. 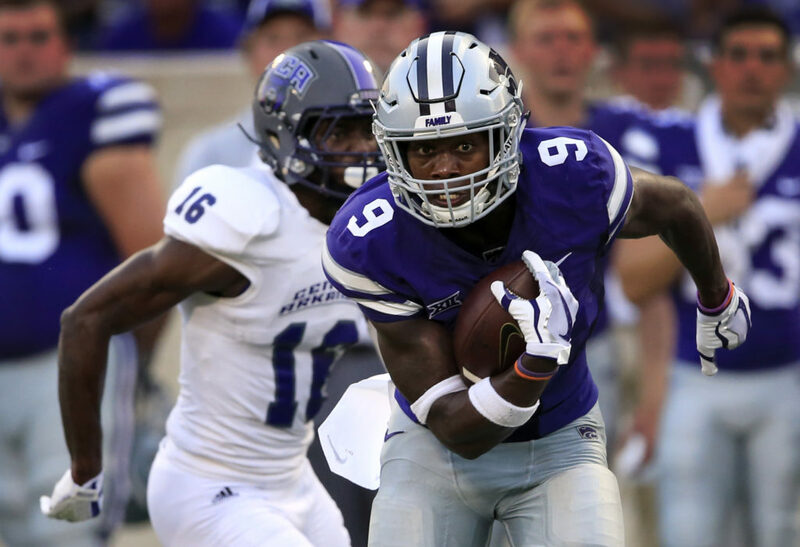 The Wildcats gave up 421 total yards to an experienced UCA offense that controlled the ball for almost two-thirds of the game, but showed improvement in the second half, and forced three turnovers. One of them was an interception late in the first half by Reed, and it wasn’t even close to his biggest play of the night. He returned the opening kickoff 96 yards to the UCA 3 yard line. Not satisfied with being held out of the end zone, he returned a punt 62 yards for a score in the second quarter. He is a perfect weapon for a program synonymous with special teams success. Quarterback Jesse Ertz showed off the deep passing threat that Snyder praised during the summer. He averaged 33 yards per completion, and looked completely in-sync with Pringle. The two connected three times for 121 yards, including a 55-yard touchdown in the second quarter. Ertz exited the game after three quarters. He passed for a career-high 333 yards and four scores without an interception. “It became obvious after a while that we weren’t running the ball,” Snyder said. “We needed to throw the ball, and we tried to take what they gave us. UCA managed to keep the game respectable for most of the first half, climbing within 17-16 midway through the second quarter. The Bears used a balanced attack and continued to frustrate the Wildcat defense on third down. But K-State’s adjustments at the half brought UCA’s upset hopes to a very swift end. K-State outscored UCA 17-3 after halftime, and all starters were out of the game by the 10:00 mark of the fourth quarter. Redshirt freshman quarterback Skylar Thompson played the entire fourth quarter, which marked his collegiate debut. He did not throw a pass, but rushed for a team-high 49 yards on three carries. The Wildcats host Charlotte next week in another dress rehearsal before a much more difficult final ten games.